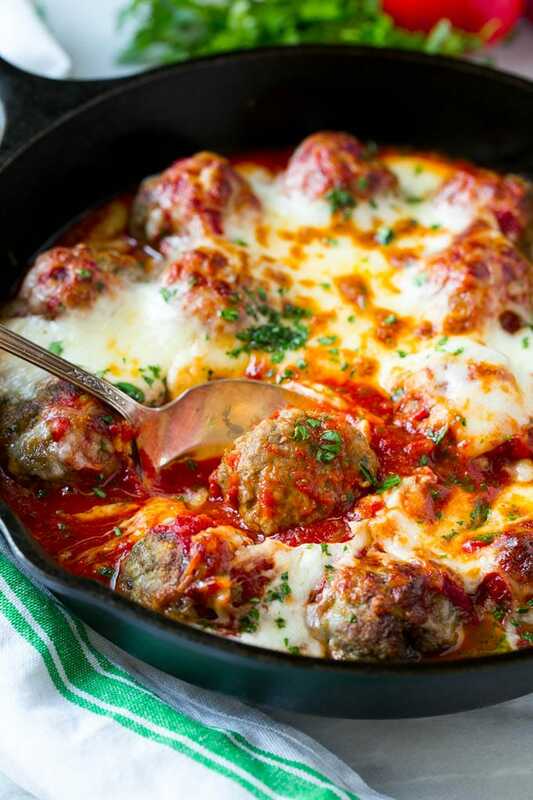 This meatball bake recipe is homemade meatballs, broiled to perfection and smothered in tomato sauce and melted cheese. A quick and easy dinner option that’s sure to please the whole family! Baked meatballs are comfort food at its finest. Serve your meatballs with a side of garlic knots and an antipasto salad for a complete meal. Meatballs are one of my all time favorite things to eat, and lucky for me, my kids love them too! 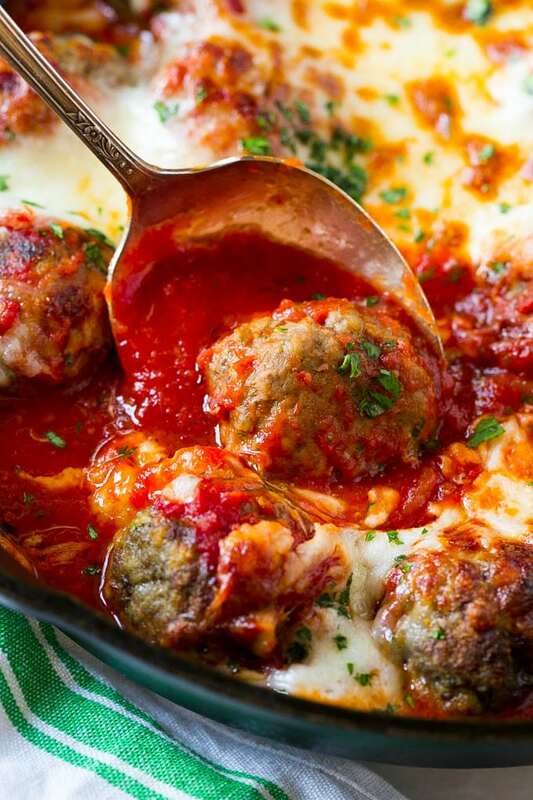 This meatball bake is the ultimate meal for all the meatball lovers in your like, how could anyone resist that blanket of melted cheese? 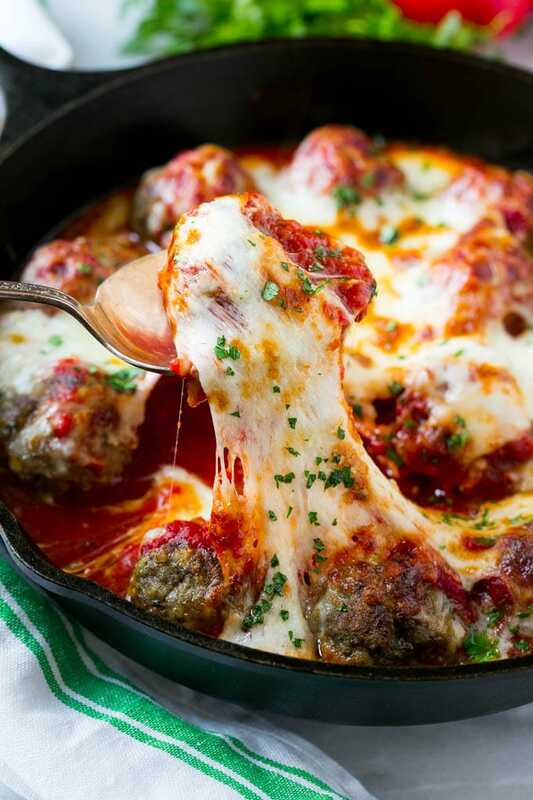 How do you make cheesy meatball bake? This recipe starts with the meatballs. I use 90% lean ground beef here, and combine it with breadcrumbs, herbs, seasonings and parmesan cheese. The meatballs go into a skillet and get broiled to golden brown perfection. 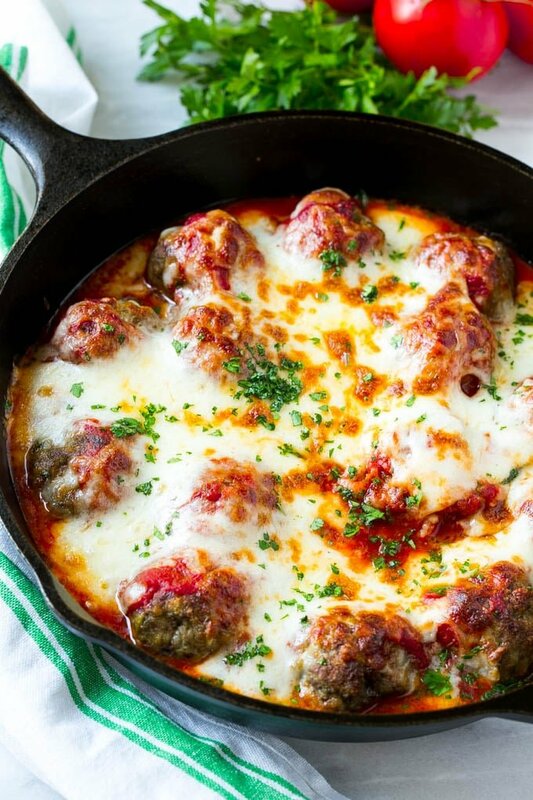 After the meatballs are cooked through, they are covered in marinara sauce and mozzarella cheese and take another trip under the broiler until everything is melted. Serve this meatball bake over pasta or as is with a crusty loaf of bread on the side and you’ve got an amazing dinner without a lot of effort! After the meatballs cook under the broiler, there may be some excess fat or liquid in the pan. That is normal, simply drain it out before you move to the next step of adding the sauce. I use a high quality store bought marinara sauce for this meatball bake, feel free to use whatever variety of sauce your family prefers. After the completed dish comes out of the oven, I like to add a sprinkling of fresh parsley, although fresh basil or oregano would also be a good choice. This meatball bake also makes a fun party appetizer, simply set out the skillet with some toothpicks or cocktail forks and let your guests indulge in all the cheesy goodness. Whether you serve this dish as an appetizer or for dinner, it’s bound to go on your permanent dinner rotation! 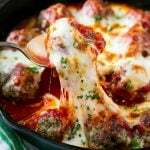 This meatball bake recipe is homemade tender meatballs smothered in tomato sauce and covered in cheese. In a large bowl, combine the ground beef, garlic, parmesan cheese, breadcrumbs, egg, salt, pepper and milk. Mix together until thoroughly blended. Preheat the broiler. Coat the bottom of a 9 or 10 inch skillet with cooking spray. Form meatballs that are approximately 1 1/2 inches in diameter and place the meatballs in a single layer in the pan. Broil for 8-10 minutes or until meatballs are cooked through and browned on top. Drain off any fat or liquid in the pan. Pour the marinara sauce over the meatballs and sprinkle the cheese over the sauce. Broil for 3-5 minutes or until cheese is melted and browned. Cheesy goodness! My family cleaned their plates! I just made a double batch of these for a Sunday get-together. My only modification was to stuff each meatball with a mozzarella pearl. They were delicious!